In my last post I had written about the stomach/abdominal pain I was having and the tests that were scheduled. An ultrasound showed I do not have gall stones, but they discovered a mass on my liver. After seeing Dr. Golden, a gastroenterologist, I had an MRI to get that mass checked out. The results of that test showed a hemangioma, approximately 2 cm in size. Dr. Golden said a hemangioma is usually of no concern. Chances are it's been there for a long time. Mayo clinic's definition of hemangioma - Liver hemangioma (he-man-jee-O-muh) is a noncancerous (benign) mass that occurs in the liver. A liver hemangioma is made up of a tangle of blood vessels. My next test was a scan to check gall bladder function. That was normal. I couldn't get in to do the last test, an endoscopy, until July 14. During that time the pain gradually got better until I didn't have it at all anymore. I almost cancelled the test, but the day I was thinking about it I had another bout of pain so I didn't. Nothing showed up on that test. My esophagus, stomach, and duodenum looked fine. He did take a biopsy to check for a certain bacteria that can cause ulcers. I don't have that result. So how should a Christian handle stress? Could I have done something different and just breezed through those difficult times feeling 100% fine? I don't know that answer, but I know the Lord was with me. I picked up a book written by Elisabeth Elliott, Keep a Quiet Heart. In the front she had a poem by Amy Carmichael. The last verse especially blessed me. Can the boat sink while the Lord is in it? There were times I felt I was going down, but with the Lord in "boat" I didn't go down. Another quote that has blessed me is, "We rightly praise God in the good times, but we learn to know God in the hard times". That is very true. Like Jacob said when he woke from his dream, "Gen 28:16 And Jacob awaked out of his sleep, and he said, Surely the LORD is in this place; and I knew it not." I discovered that once while singing "Nearer My God to Thee". "Then with my waking thoughts Bright with thy praise, Out of my stony griefs Bethel I'll raise..." Bethel is what Jacob named the place where he had the dream. "Surely the Lord is in this place...." I believe God allows hard things in our lives to cause us to draw closer to Him. Praise the Lord Whose Word is true! Where do I start... So much has happened this year! Before I write anything else I need to give a little update. In February we packed up and moved our family of eleven from Griswold, Iowa to Holmes County, Ohio. Let me just say that that was not an easy feat to accomplish! I am still trying to recover. We temporarily moved into a small house in town until the farm house was empty. We lived in that small house for two months and made many good memories, although we were very glad to stretch out in a bigger place. So, we moved twice in two months. The second move was only two miles and we had unpacked only the bare necessities at the first house, so it was a lot easier. As of now we still have a stack of boxes in the basement that we have been ignoring, mostly because we were too busy to get to them. It almost makes us wonder if we actually need that stuff if we've had it stored for 6 months. We really do need some of it. The garden desperately needs to be sprayed and a lot of the gardening stuff has not been unpacked. Irene wants her flip flops, but has looked in vain... The canning stuff needs to come out soon too. Health wise I feel like I have been on an emotional roller coaster. The week before we moved I started with pretty bad pain in my stomach. My Iowa doctor thought possibly a stomach ulcer from stress. Stress? Yes! Stress! Hmmm... Anyway, she gave me Prilosec and in a few days I was feeling much better. Since I was also haveing a lot of headaches (stress?!) she gave me something for that too. Sometime after we moved I started having pain again. This time it was more on my right side sometimes and I began to wonder if it's gall stones. I recently had an ultrasound that showed I do not have any gallstones so we're still puzzled about that pain. I have two more tests coming up. Another gall bladder one and an endoscopy to check for stomach ulcer. Part of my roller coaster experience happened because of that ultrasound. A nurse called out to schedule an appointment with a gastroenterologist because they discovered a mass on my liver. He thinks it is possibly a hemangioma, which is just a mass of blood vessels and usually of no concern. My liver counts were all very good, and he said if the mass were a tumor they probably would not be good. Yesterday I went for an MRI to check that out some more. I don't have the results yet. Switching doctors when moving is a real headache. Insurance told us they can fill one time with the Iowa doctor then we have to have one from Ohio. Well, since we were new patients, we couldn't get in for three to four months! What were we supposed to do?! Finally we heard of this doctor who works with the Amish. We contacted him and he told us to come to his house on such and such a day and he will help us out. That was so nice! He took a keen interest in my health history. He was not impressed with just taking pain medicine for my headaches. Since I had a coronary dissection he encouraged me to get a brain scan to make sure I don't have an aneurysm. I have finally gotten in with Cleveland Clinic, and now that I'm in the system, things are moving along. On Wednesday I saw my new cardiologist for the first time. Dr Kim specializes in SCAD. We had to go to Cleveland for that visit. Cleveland is a good 1 1/2 hour drive. We got up at 4:30 and left a little before 5:00. Because of some tests I couldn't eat or drink. We got there on time at 6:45. No one was at the desk where we thought we were supposed to go, so we went back to the main entrance and asked the lady there. She told us that yes, we were at the right desk, but lab doesn't open until 7:00, so we went over and sat down to wait. Lab was a very busy place that morning and we didn't get out of there for almost an hour. From there we went to radiology where I was scheduled to have a CT scan of the vessels in my neck and head. Since we knew this might take awhile and Edward couldn't be with me anyway, he went for some breakfast. After signing in and waiting a bit in the sub waiting area I was called in. The lady put an IV in my arm and then I was sent out to wait again. Soon I was called in for the scan. I could stay dressed this time, but I had to take everything out of my hair. The scan actually didn't take long at all. The IV was for the contrast dye - unpleasant stuff! All of a sudden this warm feeling goes through you and you get a metallic taste in your mouth. After a few moments it's gone again. They told me to be sure to drink a lot to flush it out of my body. My last test was an echo cardiogram, and from there we went to see the doctor. That was very interesting! The doctors in Omaha didn't know much about SCAD. She specializes in it. She had received all my records and showed us the pictures of the catheterization they did when I was having my heart attack. With all the SCAD patients she has seen, my cath pictures were the first where she actually saw the artery dissecting right in front of her eyes. She showed all that to us. At the beginning she said, "Here is the LAD artery. Here is the catheter. Here is an abnormality and then all of a sudden the artery just simply disappeared. That was when it dissected further and was completely blocked - no blood flow going through, which is why we couldn't see it. She said if you would not have been in the cath lab when that happened the out come would have been very different. Then she showed that here they come with a wire to open it and here they are placing the stents. Very, very interesting. She said several times she is very impressed with those doctors. They did a very good job. Placing stents at the top of the LAD is hard. I remember when he was doing it I thought the doctor seems very impatient or in a bad mood because he was yelling. Now I realize he was probably scared and working really hard and fast to save my life. Thank you to that doctor, and I don't even know who he is. I assume he was on duty in the cath lab that day. I don't know if he ever came to my room to see me. We are so thankful to God for the wisdom he has given these men. Afterward, she showed us the pictures of the CT scan I had that morning. No aneurysms showed up, but my left carotid artery has an extra loop. That is not normal, but should probably not cause any problems. It is a marker indicating abnormalities in my arteries. She doesn't think I have FMD because nothing else showed up. She gave me a complete physical examination looking for other markers. So I found out I am extra flexible and my skin is extra soft. I never knew that! The lining of the arteries is connective tissue. So if my joints are extra flexible and my skin extra soft, it indicates the lining of my arteries might also be so. Anyway, that's how I understood her. I had stopped taking my cholesterol medication because I simply do not like having to take it. Well, my LDL (bad) cholesterol is too high, so she put me back on a different one and also switched me from Prilosec to ?? don't remember the name. The rest of the meds she kept the same. So I thought I should tell Dr. Holmberg he was doing it right. He used to tell me he really doesn't know how he should be treating it, since there is so little information out about SCAD. My only restrictions are no lifting heavier than about 50 lb and no sudden jerky movements like roller coasters. It was almost 12:00 when we were done. We went up to the main entrance and handed our ticket to the valet service. Cleveland Clinic is such a huge place and we didn't know where to park. Since valet service was only a couple dollars more than other parking we took advantage of that. From there we went to an Italian restaurant for lunch. And then we drove around looking for Starbucks so that we can make it home without falling asleep! :) After all, I had to drink a lot that day to flush the dye out... On The way home we stopped at Lowe's and Walmart in Wooster. It was 5:00 by the time we came home. My bed felt sooo good that night. Recently I have been feeling very overwhelmed with the busyness of a large family. September is always a difficult month for me. We have come through most of the busy canning/preserving season. There are still things to finish. And then we start school. This year we have five children in school (home school), from 1st. grade to high school. On top of that we've had dentist, eye doctor, orthodontist, and doctor appointments to go to. Today I have to take four year old Rhoda to the dentist because her filling fell out. Michael (2) woke us early and a thunderstorm went through at 5:30, and we are getting ready to leave for a trip to Ohio tomorrow. I got up feeling like this busy day has gotten off to a bad start. I prayed that God would allow my Bible to open somewhere that would be encouraging to me. It opened at Daniel 6. I almost didn't read it, wishing it would have opened somewhere in the gospels. But God had allowed it to open there for a reason. The king asked Daniel if his God is able to deliver him from the lions. Is God able to deliver me from my lions of fears, anxieties, cares or whatever... Is He able to keep me from going over the edge? I will have to take one thing at a time and if I start feeling stressed out I have to remind myself that my God is able to deliver me. What are the lions you are facing? Saturday night we were just falling asleep when our door creaked open and Marian, age 10, was standing there. "Do you want something?" we asked groggily. My heart sank way down as all the possibilities of what this could mean raced through my mind. Most of the time when she starts throwing up it's every 10 to 20 minutes and doesn't stop until we end up in the ER for zofran administered by IV. I helped her get settled again with a bucket on the chair beside her bed. I gave her a zofran tablet to dissolve under her tongue, but that didn't stay down. She is very good about always hitting the bucket, so I went back to bed and tried to get some sleep. Later in the night she came over again and said she would like to have some ice chips. I went downstairs, switched on the light and filled a cup with ice. Since the other zofran had not helped anything I was getting another one when Irene came around the corner. "Are you alright?" she asked. Here she was sick too. I put the zofran back in the cabinet. If it was a stomach virus, that was not what Marian needed. I went back to bed, but didn't sleep well. I was planning a trip to PA with the two little girls. What if we all came down with the stomach flu??? Lamentations 3:38-41 Out of the mouth of the most High proceedeth not evil and good? Wherefore doth a living man complain, a man for the punishment of his sins? Let us search and try our ways, and turn again to the LORD. Let us lift up our heart with our hands unto God in the heavens. That was a good meditation. I had often pondered the whys. Why, when we pray and pray for Marian to stop vomiting we still end up going to the hospital for IV??? Don't we have enough faith or ???? I guess if God would just instantly give us all the things we ask for we would never learn how to be patient in tribulation. We would never have a cup of trials to drink. Another reason I have struggled with that question is because of some people who have indicated it's a lack of faith to go to a doctor. We should trust God instead. Which reminds me of the first time we took Marian for IV when she was dehydrated. Dr. Schmadeke said he wonders how many lives could be saved all over the world if people would have access to IV. Then he said natural remedies are alright, but sometimes a doctor's help might be the way God is answering our prayers. He related the story of a man who was stranded on a raft out at sea. The man was praying that God would rescue him. After a while a helicopter came and dangled a rope to pull him up. The man waved it off and said God will rescue him. The helicopter was God's way of answering his prayer and he rejected it! One day soon after I came home from the hospital I was resting on the couch. The CD player was playing softly. A group of young people were singing heartily, "All to Jesus I surrender, all to Him I freely give". The words grabbed my attention. ALL. FREELY GIVE. I wonder if they really realize what they are saying? Sure, what Christian wouldn't say that? That is the right thing to say. How often did I sing that song, but didn't realize the depth of the words I was singing? The attitude of my heart was right at the time, but I didn't understand the depth of the words. Now Jesus was asking for my health, and I did not want to surrender it. After several weeks I started having some definite discomfort in my chest area. It wasn't bad enough that I could call it pain, just some discomfort sometimes. It scared me pretty bad. What is going on? I talked to the cardiac rehab nurses about it. Peggy wondered if it's worse when I exercise. "No", I said, "that doesn't seem to make it worse. Actually it doesn't seem to bother me as much then as when I am resting." She didn't think it sounded like a heart problem and suggested I take Tums and see if if that helps. It did, so she said I should take Prilosec, which is an antacid that I would have to take only once a day. I had a visit with Dr. Wilcox to get a prescription for Prilosec. She said so many people take it, it's almost like handing out candy! My discomfort/heartburn/acid reflux (or whatever) was likely a result of all my medications. Anxiety probably contributed to the problem too. I talked with her about my anxiety and fears. She said she could give me something to help me. I told her I would rather not at this time. I was already feeling somewhat better. I knew if I could take my thoughts captive, with the Lord's help, I would be able to overcome the anxiety. Her caring kindness helped too. After several months I was able to get off the Prilosec again. To this day I still get pretty scared whenever I feel discomfort, muscle twitches, or anything in my chest area. I told my husband I never know anymore if what I am feeling is heartburn or not. I cannot feel the difference. Michael was 12 days old when I went to the hospital. All of a sudden his care fell on others. That was hard for me to accept. I love the newborn stage. Most days they brought him along to the hospital. Even though I wasn't able to do much with him, I enjoyed having him there. At night Irene and Annetta took care of him. He was a very good baby. We were so thankful for that. Our last three babies were very fussy. It seemed so strange to go to bed early and let the girls put the baby to sleep. It didn't feel right at all, but at the same time I really didn't care. Like I wrote before, I had lost those motherly feelings. It was almost as if he were someone else's baby. My body had gone through a shock and was in survival mode. I had to make a conscious effort to regain those "motherly feelings". I didn't want him to bond with someone else, so I tried to be the one to give his bottle and change his diapers etc. After a week and a half I felt able to take care of him again at night. It made me pretty nervous. I wasn't used to giving formula and had to figure out all that. We were boiling all the water. At first we warmed his bottles. How do you do that? Microwaving isn't recommended. It takes a long time to warm if you set it in hot water, which is what the girls were doing at night. To make it easier we decided to put warm water in a thermos, then I could mix the formula when he woke up. So we moved his crib back to our room. I fed him and rocked him to sleep that evening. We made sure we had all the supplies we would need during the night, then went to bed. Do you think I could sleep? NO! I tried to, but I was aware of every little stir that he made and thinking about how to get his bottle ready etc etc. He slept pretty good, but I did not. Finally at 3:00 I took him over to the girls and told them, "I am sorry, but I need to get some sleep too, and I simply cannot sleep with him in the room." We made a little nest for him on the floor of their room. I don't remember, but he probably didn't wake up the rest of the night for them. We kept his crib in our room and eventually I learned to sleep again. Dr. Wilcox told us a lot of people do not warm up the formula bottles. It did not seem right, but we soon stopped warming up his milk and gave it at room temperature. It didn't seem to bother him and when he was older he didn't like it warmed up. Two and a half years before my heart attack Dorcas Wenger died from a spontaneous coronary artery dissection - the same as I had. She too had a newborn baby. 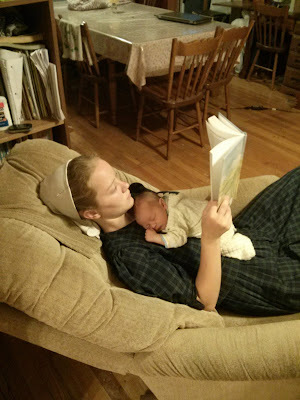 Recently I heard of two Amish mothers who passed away. One of them had a three day old baby and died of an aneurysm. The other one was killed in an accident. My heart goes out to the sorrowing families. I feel humbled that God spared our family that grief. Several months after my SCAD I got a phone call from Viola Martin in OH. My aunt had given her my number. Viola had also had SCAD. It was so interesting to talk to someone who had gone through the same thing. She too had a two week old baby when it happened. Hers was worse than mine, with three arteries dissecting. She had six bare metal stents put in. Later she needed to have bypass surgery because they had clogged with scar tissue. After talking with her I felt like I had not gone through much! Then I also got a call from Mr. Bowman in Ontario. His wife had just come home from the hospital after having SCAD. She did not need stents or surgery. As far as I know she has recovered well. I should call or write to her again. She also had a two week old baby. July 14. A day that has a flood of memories. The anniversary of my SCAD event. As I was thinking over the hills and valleys of the past two years I thought, "God is good - His mercy endures forever". He carried me through the low times and was with me through the good times. This morning I read some of the verses that had been such a blessing to me while I was in the hospital and the future looked scary. "Thou wilt perfect that which concerneth me". I felt like God was answering the cry in my heart and telling me, "Everything will be alright". Now two years later I can say that everything is alright. I experienced a complete recovery exactly as the doctors predicted. Life has returned to normal. Some things will never be the same again. I will always have those stents in my LAD artery. Will they cause complications in the future? I don't know, but I know who holds the future. I will not feel anything in my chest without some apprehension. But by the grace of God I will rejoice in the Lord, knowing that He makes no mistakes.